MWTV Italian Insanity Sunday Celluloid Session! Tonight's Magic Waves Live Show from Newcastle has had to be postponed until next week due to technical issues... but fear not! 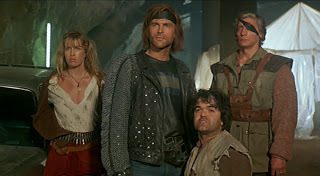 MWTV presents instead a trashed out post-apocalyptic, cyborg, cop, dinosaur, vigilante and 'Nam infused session of the dirtiest Italian celluloid that the late 70s to mid 80s has to offer! Running way past midnight into the small hours! Just hit the Magic Waves tab under "Television" and let the insanity ensue!